Ricardo Cavolo is a Spanish artist, whose style, with a great sense of humor, is a fantastic mixture of religious art, Russian criminal tattoos, South American flora, nautical themes, and naïve, outsider art. Born in Salamanca, Spain, in 1982, in his father’s painting studio, Ricardo was predestined and engaged in the artistic world since birth. He grew up playing with brushes, colors and paintings. After working for some advertising agencies, Cavolo got a pair of work for Cirque du Soleil, giving him a verve to start working for himself, in his own art studio. 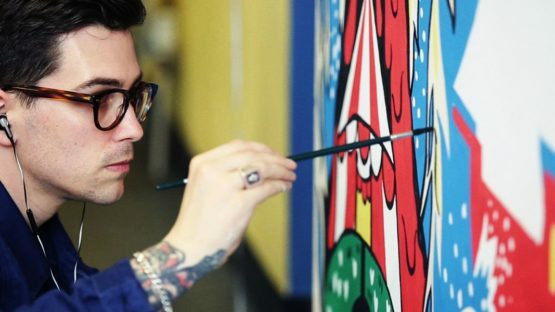 In three years of his artistic independence, he illustrated many books, magazines, t-shirts, and designed tattoos and most recent, murals. At the same time, Ricardo is making personal projects for exhibitions all over the world. Crucial moment in his artistic growth was the discovery of outsider, naïve art, which is now the main inspiration in his oeuvre. Always working around portraits, even when he wants to speak about something more in general, Ricardo is astonished about each particular life, finding in it magic and unique stories. ‘Every portrait speaks about something big in life,’ the primal painter says, ‘love, madness, roots, bravery, misery, hope. A portrait can hold an entire universe in a single face.’ His series of portraits for a show named Life and Lives, display society’s outsiders – from artists and orphans to prisoners, feral children and slum kids, in order to tell multiple stories about their unusual, marginalized identities. Ricardo also draws inspiration from tattoos and their visual aspect. Seeing tattoos as codes and a way of speaking a new language, characters living in his paintings are depicted in his own graphic alphabet. A perfect tool that creates little stories inside another, bigger story, tattoos, like magical symbols and talismans, explain the whole life of characters, being a biography in the skin. Cavolo’s distinguishable flash-style tattoo inspired and bold creations, usually made with traditional techniques and materials such as watercolors, inks and acrylics, depict misfit characters in Frida Kahlo-esque folk art tones and bring them into a contemporary context with details like glasses, tattoos and bikes. Through all of his works, Ricardo uses bright blues and reds to decorate his characters. His large body of work include murals, a painted ukulele, customized sneakers and painted logs. Ricardo Cavolo now shares his time between Brighton, UK and Madrid, Spain.